A new section of trail was added recently to bypass a long stretch of old trail that ran through a rough, sandy portion of the Yetman wash.
Tucson Mountain Park is an-ever evolving trail system that’s had quite a bit of new trail added to it in the last couple years. Located close to town and near the J.W. Marriott Starr Pass Resort, this system is very popular with hikers, trail runners, resort guests, and mountain bikers. TMP has numerous trailheads which allow easy access from any direction. 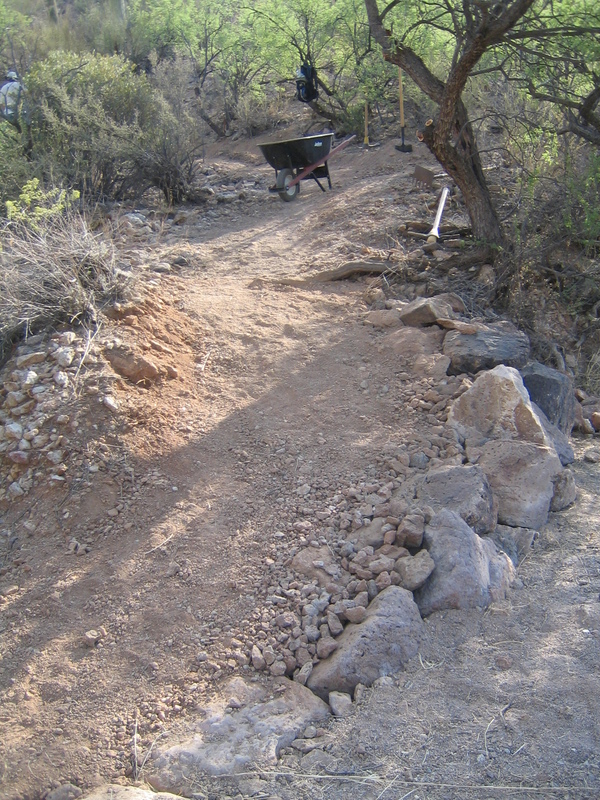 As an employee of Pima County, Mark Flint has been involved in planning, design, volunteer coordination and construction project management for these trails. Sweetwater is a highly popular scenic trail system located West of Sweetwater Drive, on Tortolita Road off of El Camino Del Cerro. Robles is a 16-mile trail system that was added to Tucson Mountain Park. It is located between the Ajo Highway, Mission Road and Irvington Road, and is accessible from Tucson Mountain Park via the Explorer Trail. As an employee of Pima County, Mark Flint was involved in planning, design, and construction project management for this trails park.